The leaves don't fall in Hollywood, but that doesn't mean you can't sip a cocktail while reconnecting with old friends and making new ones. You are invited to an IVY LEAGUE back to school mixer in Hollywood. Expand your network by mixing with entertainment industry professionals from University of Chicago, Yale, Brown, Columbia, Cornell, Harvard, Stanford, Princeton, U. Penn, and Dartmouth. Station will be offering exclusive "Ivy Entertainer" drink specials. 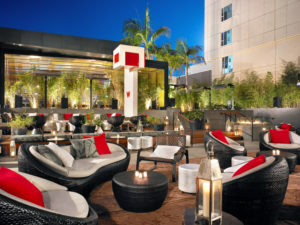 Step into the hottest new hideaway at W Hollywood’s exclusive outdoor oasis, STATION HOLLYWOOD. We'll have fun while sipping cocktails on the beautiful outdoor patio. Located just outside of the Living Room and adjacent to Hollywood Boulevard. Station Hollywood, the outdoor lounge at W Hollywood features intimate lounge seating, fire pits and an outdoor bar to cater to your every desire. Cash bar. Our past events have been at capacity, so secure your spot now at this exclusive event and don't miss out on THE back to school party this fall.